These are the famous model rocket engines that made model rocketry the safe hobby it is today. They incorporate a safe, intelligent design, manufactured under precise and strict engineering tolerances. 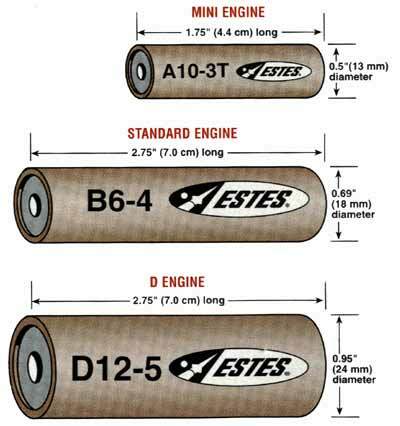 Estes model rocket engines have been proven consistent and reliable in more than 300,000,000 launches. They are the key to the outstanding safety record model rocketry has achieved over the past 40 years. Insert engine into rocket. Insert igniter and igniter plug into engine. Place rocket over launch rod on launch pad, hook igniter clips to igniter. When launch button is pushed, engine produces thrust and boosts rocket into the sky. After propellant is used up, delay is activated allowing rocket to coast. Smoke is emmitted for tracking. After delay, ejection charge is activated, deploying recovery system. Launch Pad 2000 offers several Quest, Estes, and AeroTech model rocket engines that range in total impulse from 1/4A-F. These engines may be used with the rockets listed on these web pages or other Custom, Quest, or Estes model rockets. The description of each kit lists recommended engines. Select your engines based on these recommendations. Rocket engines are labeled with a coding system that fully describes the engine. The letter indicates the engines total impulse in newton seconds. Each succeeding letter has up to twice the impulse of the previous letter which results in approximately twice the altitude. For example: a B motor has twice the impulse of an A motor, and a C motor has twice the impulse of a B motor, and so on. The last number gives you the amount of delay between the end of thrusting and the ejection charge. Engines with a 0 second delay are used in the bottom stage of a multi-stage rocket.